Christie with her Art Weave piece. The Bulloch Hall Quilters were a lively, fun, out-of-the-box bunch of quilters that embraced the Art Weave technique. 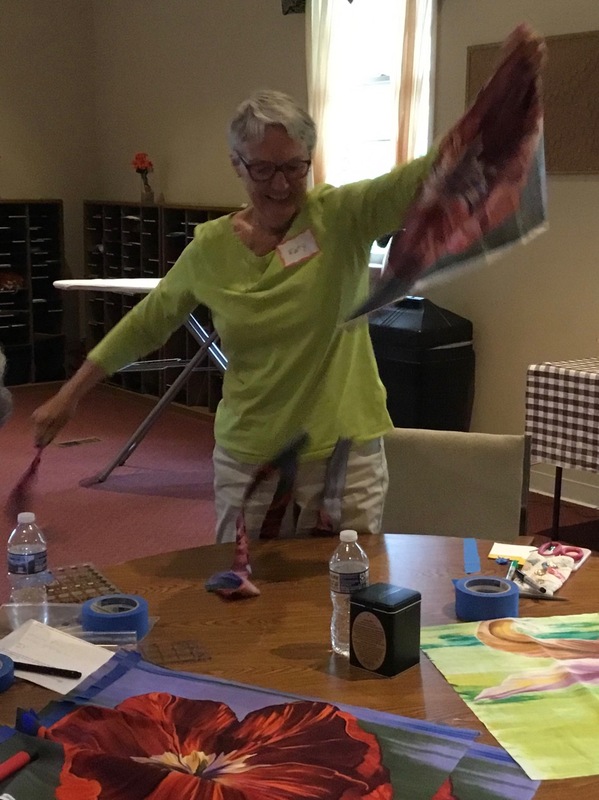 I had so much fun with them in my workshop last week. As each student introduced herself—mostly for my benefit because they knew each other from the guild—it quickly became evident that this was a group of experienced and multi-disciplined quiltmakers. 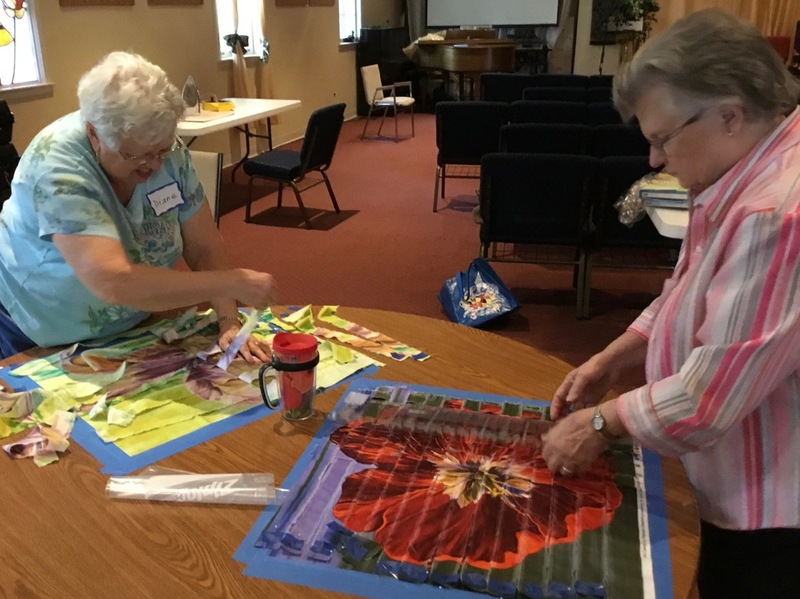 Most of the women indicated they make all kinds of quilts—traditional, contemporary and art quilts. Some liked appliqué, there were some garment sewers, and one or two relative beginner quiltmakers in the group, but overall, they were self-proclaimed "eclectic" and "multi-faceted" quilters. 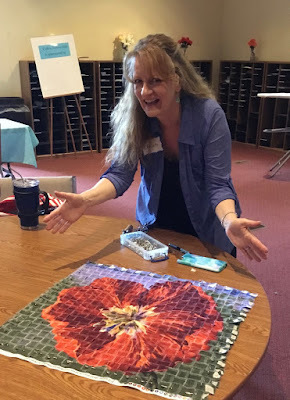 One even traveled from South Carolina to take the workshop. 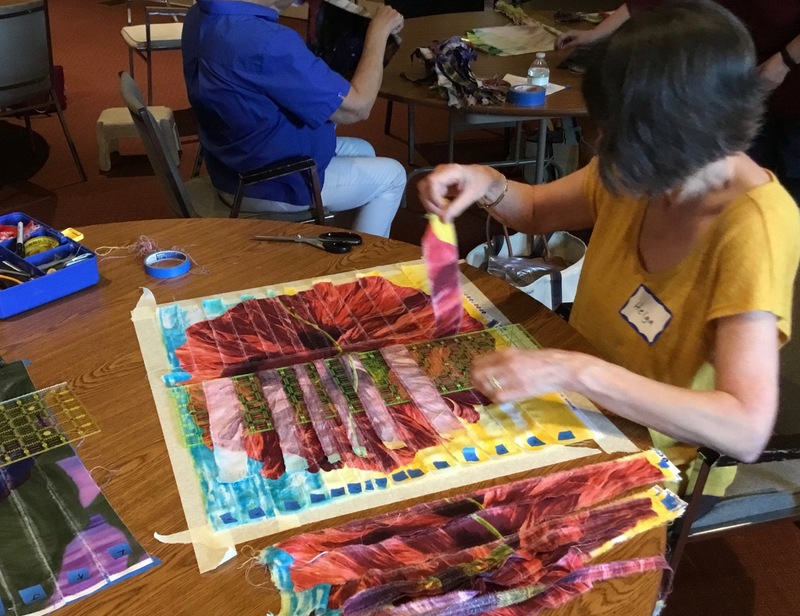 Art Weave is a fun, no-fuss, liberating technique. 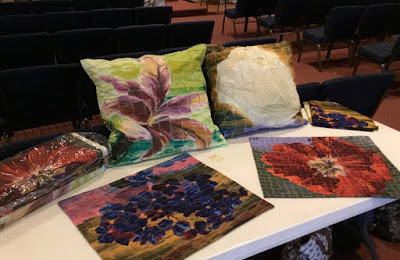 I was able to borrow two Art Weave pillows from my sweet MIL, so along with my two samples, I had several examples at the workshop of the potential this technique has to offer. The ripping and stripping part is my favorite step in the process to watch! Ms. P took to it like a pro! 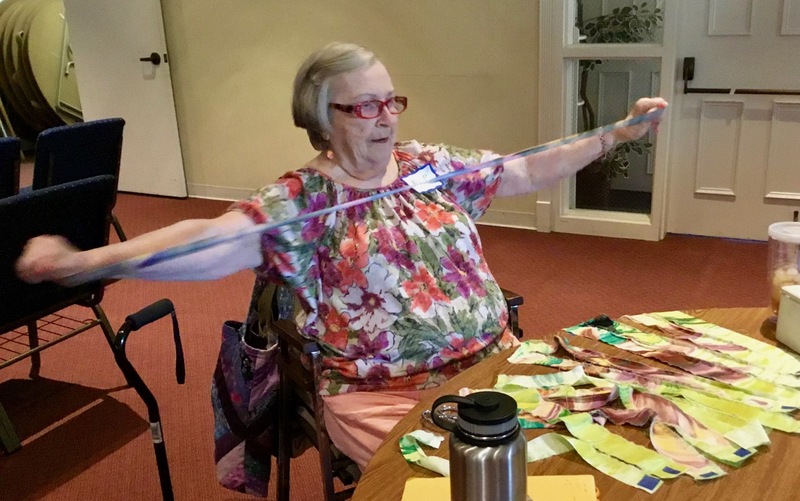 Ellen is making strips for the violets. It was great to have my friend and former business associate, Karen, in the workshop. was my hostess and did a great job preparing and packaging the class kits. with the Art Weave technique. Here is Lisa, the previous guild President. I saw your sample and wanted to make this project. I like to learn new things. I am a workshop junkie. I like to work with and make things with fabric. I wanted to learn how to use these large, artistic, floral prints. The supply list was short! I didn't have to bring my sewing machine to the class. I didn't have to bring a rotary cutter or those large cutting mats. Diane (left) and Ardie weaving. Joan chose wider strips for her Art Weave iris. 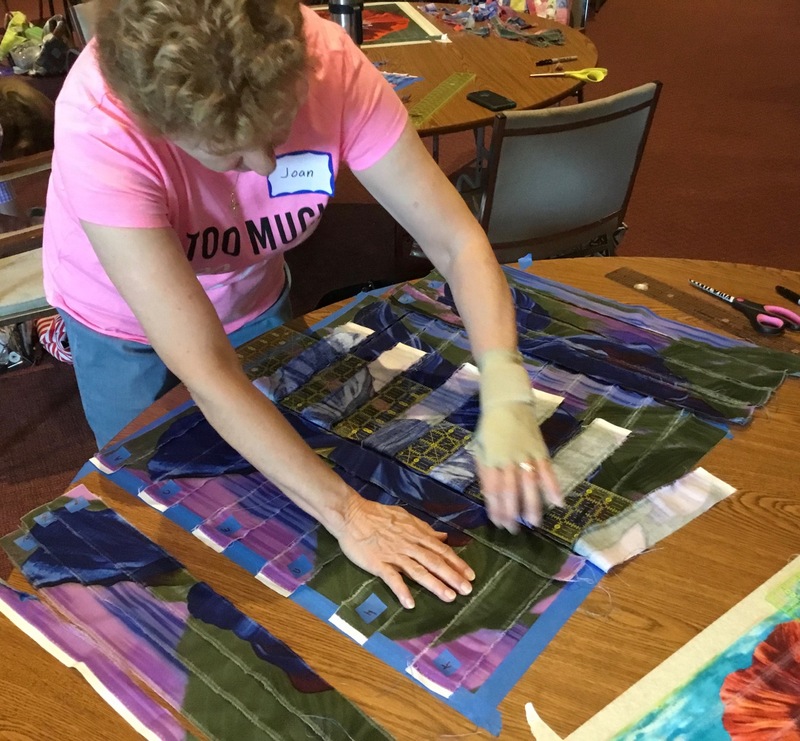 Helga created her piece with multi-width strips. I can't wait to see this one finished. 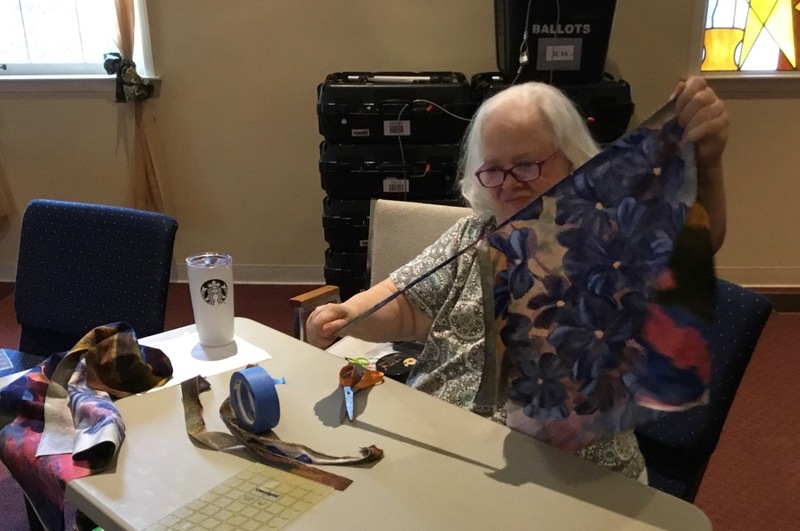 Ms. P weaving one of the iris prints. When the workshop concluded, we were all treated to a lovely and tasty "Salad and Dessert" potluck lunch. (Great idea, Holly.) By the way, these women are talented cooks, too! 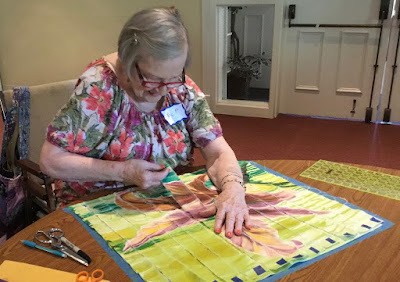 Art Weave workshop with the Bulloch Hall Quilters. I appreciate the invitation to teach this workshop for the Bulloch Hall Quilters. I did a trunk show program for them in May, but their schedule could not accommodate a workshop at that time. 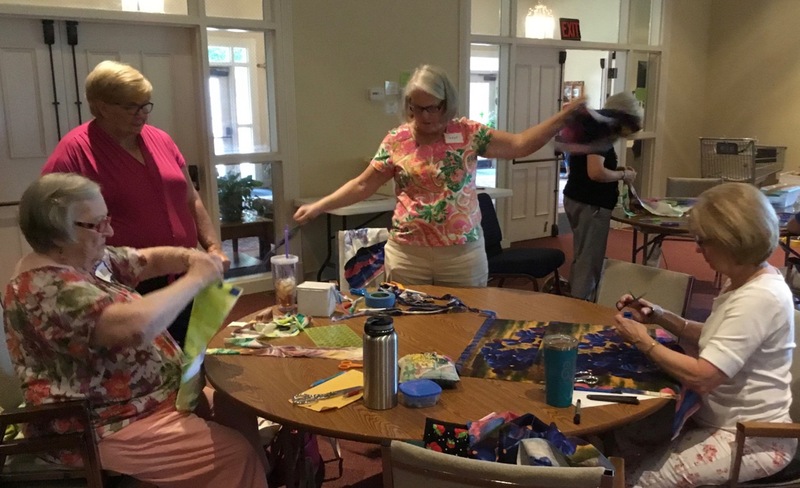 Generally, this guild does not hold guild meetings or events during the summer, but they were flexible in working with my travel schedule and I am so happy they did. 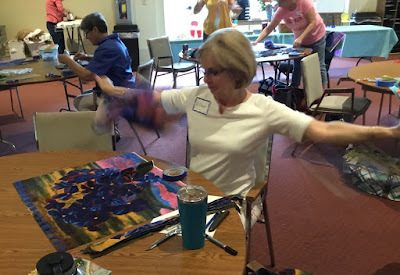 A summer get-together making fabric art with friends was refreshing and energizing! 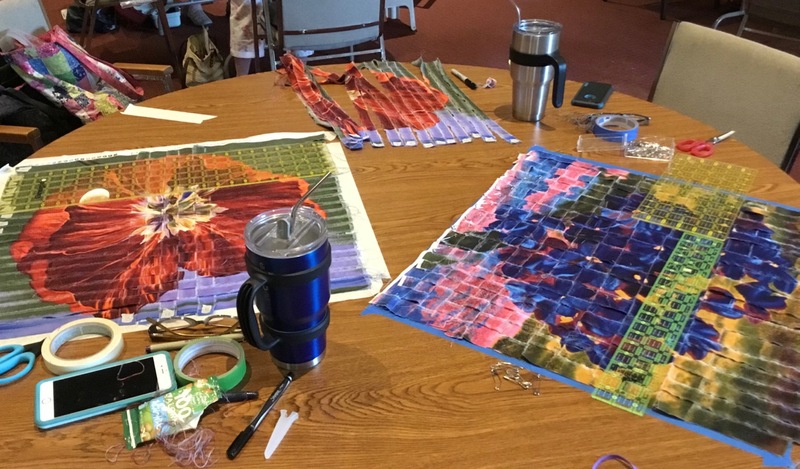 I can't wait to see all their finished Art Weave pieces. Bulloch Hall Quilters: Please post pics of your projects on Facebook and Instagram with hashtags #artweave and #frondfabrics. Follow me on IG at veronica.fiberantics. 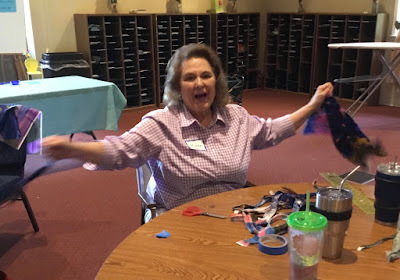 Thanks again to Holly for coordinating the workshop and to her and her husband, Ken, for their gracious hospitality!